Inflatable photo booth hire in black and measures 2.7 meters in circumference and 2.25 meters high. Although it is big it will fit into most venues and houses. Taking 30-45 minutes to set up and it can fit up to 10 people at one time (depending on size). This comes complete with green screen (optional) and a constant light, no strobes or flashes are used. Using a Canon 600d camera and set up to provide the best instant results possible. This is packed away in storage boxes and can be taken up stairs even if there is no lift. 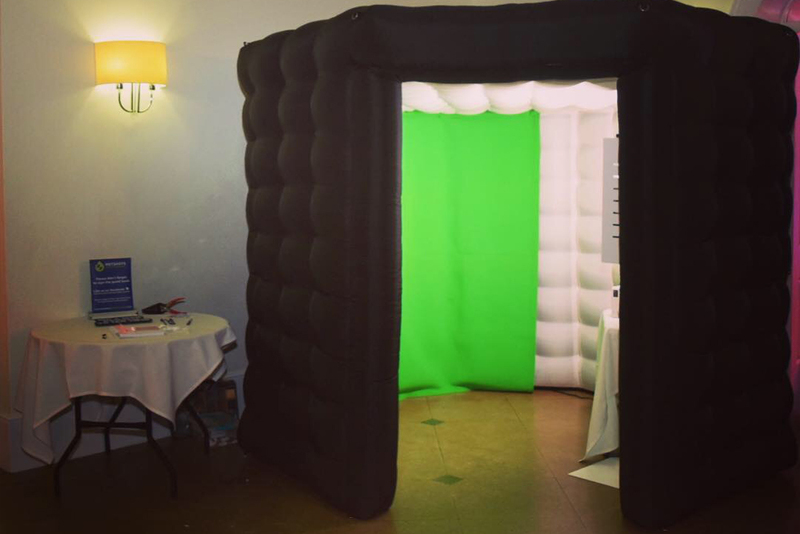 This inflatable photo booth hire includes unlimited visits to the booth. Instant double 6×4 prints (or strip 2×6), personalized guest book, online gallery, props, green screen, plus a booth attendant. There is an unlimited option, unlimited prints for every guest in the picture will receive a 6×4 print plus one for your guest book. Book this for an extra £50 for this option.